There's a feeling that came over me at one point during director Lenny Abrahamson's Room that I don't often experience. I'm sure others felt it too. It is a feeling brought on by an acuteness of suspense, most often reserved for the loftiest of thrillers. Take the final moments of last year's Indie darling, the revenge thriller Blue Ruin, for example. But here, in a movie that is so tender, so loving of its characters, I can't imagine how it was executed so perfectly. That's not to say that this film is perfect. In fact, by the end, I struggled to decide how I might rank this film. I felt it left things out that I wanted to know. It introduces an important character and lets said character just disappear. Then, I had to be reminded of something: this film is based on a novel, a novel told from the perspective of a 5-year-old boy. It's hard to admit (since I don't know what to make of needing this knowledge) but having it made this film great for me. Without it, I wouldn't be so sure. Room stars Jacob Tremblay as Jack, the 5-year-old boy in question. As the film opens, Jack's daily routine is presented, a routine of "small things" in a "small place" alongside his Ma (the most amazing Brie Larson yet). It's his birthday, and he and Ma will make a birthday cake. The "room" in question is a shed made into a tiny apartment of sorts, locked by a digital keypad, controlled by a man only known as Old Nick (Sean Bridgers). Old Nick, come to find out, has held Ma (as we know her for the first two acts) captive for seven years. I'll leave it to you as to his motives. This movie works on the element of surprise, throughout, more so than just about any I've seen this year. That feeling I was talking about. It extends from an obvious labor of love between a novelist adapting her own book in Emma Donoghue and a filmmaker in Lenny Abrahamson, who, with only a small oddball comedy called Frank (unseen by me) under his belt, is proving to be one to look forward to. It works on our hearts. We love these characters, and we love their love. We know and understand their bond. This and only this is what makes the daring, the suspenseful situations so perfect. The fact that Abrahamson and Donoghue take their time in creating the world of Room so fully and clearly is everything. And the tension they are able to achieve without over-stepping into outright disturbing stems from (and works with) that as well. 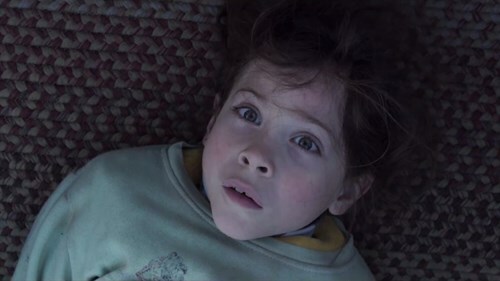 Young Jacob Tremblay, though, truly carries this film. He is the most confident child actor I've seen in years, hitting every emotion required of him, reading a voiceover narration (sparingly) that will tug on your heartstrings like nothing I've seen (or heard) this year. It is so exciting to see. Both of these talents received Screen Actors Guild nominations today for Best Actress and Best Supporting Actor, respectively. Again, Oscar nods are forthcoming. When I left the theater, I was supremely satisfied, yet the final act of Room isn't quite as emotionally effective as the first two. As I said before, I found myself questioning a couple of threads this film started in the second act that just didn't go anywhere. Like, why hire William H. Macy for what amounts to a half-day's work at best? I think it's the grown man in me, my demographic, that blinded me to this fact of which my wife most kindly reminded me: "But the book is from the kid's perspective, and so is the movie." How right she was! And how good that is! I'd say it borders on disturbing, and that's the best thing about this one. It rides a line but doesn't cross it. And it's all the more effective because of how real it seems. I can't imagine what a scenario like this would do to a child. Great review! I'm seeing this on Friday and I can't wait. I read the book, and I feel like it might work a bit better in film form. I'm eager to compare the two. Thanks! Haven't read the book, but I can only imagine that will make this experience richer. I hope so, at least, for your sake. I loved this film. I think it's one of the ten best films of the year in my opinion. However, I agree with you on the whole William H. Macy thing. I think (even though it was based off of the book) that there should have been some sort of reconciliation towards the end between Larson & Macy. But besides that, I loved the film. It was quite an emotional experience. Not something I would want to re-watch a lot but really solid. I agree with you too. I almost cried at this film. (I don't really cry at films a lot. The last one I did cry at was Shine, the film with Geoffrey Rush. But I digress...) Anyway, this is one of those films that I will probably re-watch only once or twice a year. It was just so emotionally wrecking. Even though I read (and loved) the book, the escape sequence had me on the edge of my seat and in tears. Ugly cry all the way. 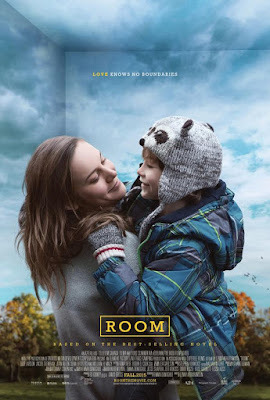 Room is easily the best of the year so far for me, with Larson only having competition from Lily Tomlin for Best Actress. Great review! Oh, man, did I cry! Really need to see Tomlin's work. That movie got no play whatsoever around here. Thanks! It really is. Full emotion! Thanks! Great review, but this movie is hard for me to think about. You know I don't like twisted stuff like this. I love the Joan Allen character. Yeah. I should've given more credit to Joan Allen. She's always great.